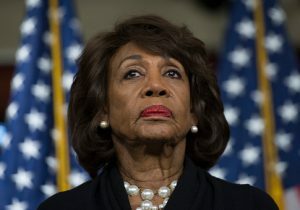 The amount of reported debt owed from Rep. Maxine Waters (D., Calif.) to her daughter for running a lucrative campaign operation shot up $90,000 in a matter of weeks, according to new filings to the Federal Election Commission. Karen Waters, the daughter of Rep. Waters, is in charge of a slate mailer—or endorsement mailer—operation for her mother's campaign committee that has pulled in generous payments from other political committees. In order to appear on the mailers, which contain a sample ballot and quote of support from Waters, a politician must pay Waters' campaign from their own committee. Oftentimes these payments range anywhere between $2,000 and $30,000. The mailers are sent to residents in South Central Los Angeles. The operation has proved profitable for Karen Waters, who has collected $800,000 since 2004 when the Federal Election Commission granted Waters permission to run the mailers from her federal campaign committee. Prior to 2004, Waters ran the slate mailer operation from LA Vote, a state committee in California. Karen collected $108,000 in payments as of Oct. 17 for the midterm election cycle to run the slate mailers and was owed another $94,000 at that time. Now, Waters's campaign committee reports an additional $89,022.15 that is owed to Karen, which was racked up in a matter of weeks, according to Dec. 11 post-general filings. The $89,022.15 in new debt was incurred between Oct. 18 and Nov. 26, the filings show. Karen is now owed $183,022.15 on top of the $108,000 she has already collected during the midterms. The slate mailers have pulled in hundreds of thousands for Waters's campaign committee this cycle from the likes of Gov.-elect Gavin Newsom and Sen. Barbara Boxer, among a number of others. Democratic politicians such as Sen. Kamala Harris have paid tens of thousands to appear on the mailers in the past. Waters' campaign did not respond to a request for comment on the newly reported debt by press time.